1) The ancient name of India was Aja Nabha Varsha. Bha means light and knowledge. Rata means devoted to light as against darkness. According to another source, the name Bharat for India is derived from king Bharat, the son of Shakuntala, wife of king Dushyanta. 3) People who lived on the bank of river Indus were called originally as Indu and later as Hindu and the land came to be called as Hindustan. 4) The name India was given by the British. 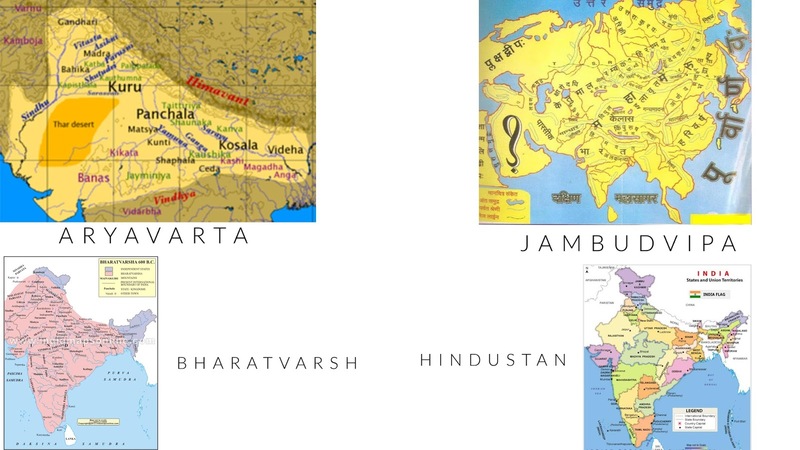 5) Aryavarta is another name which refers to India.The Aryans who entered the country,ruled it, and settled here.Aryan means good and noble. The natives who were non-Aryans were called as Dasyus. 6) JambuDweepa ( the shape of India resembles jamun fruit) is the vedic name of India. 7) Tianzhu(=spiritual center) was the Chinese name during Tang Dynasty for ancient India. This was because of the Indian origin of Buddhism. 8) Before the British and Muslims came to India, our Bharat Varsha was a land of plenty and was nicknamed as ”Sone ki Chidiya” (=”Bird of Gold”)-according to author Shri S.P.Attri.